I am super behind in posting some of the food I have been eating. What's new. I've been mixing it up a bit by swapping between recent and past eating adventures in my posts, most of the time it doesn't make much of a difference unless there has been a menu change. This one is super dated though, to September last year. Yikes! Mum and I went to Grown on their first birthday. They had a very special menu for the day, so it doesn't really matter too much that I posted it so late because unless you were there on the day, these special items were not available before and have not been available since. As seems to be the tradition, it was a rainy day when we were there. Every time the two of us has been it has been raining! Now when it is raining, we always want to go to Grown. Anyway, you can see other Grown adventures here. I had the 'I Can't Live Without Cheese' Cheeseburger, that had confit jerusalem artichoke, cheddar, pickles, and mustard. I also took the option of adding on a hashbrown, because why not. I didn't realise that this didn't actually have a patty, just the confit jerusalem artichokes. That plus the hashbrown made for a very starchy burger. But it was tasty. I couldn't really taste the cheese though, which was sad for a cheeseburger. My mum is obsessed with their tofu scramble, she has it every time we go. She was sad that the tofu scramble was not available on the special menu, but perked up when she realised they had a scrambled tofu wrap. 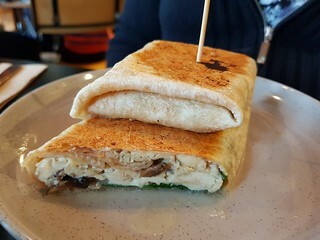 The same delicious scrambled tofu with spinach and sesame cheese in a wrap. 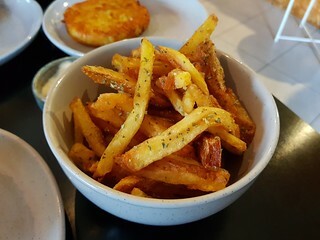 We also shared some Triple Cooked Hand Cut Fries with Aioli, because you should always maximise your potato intake. They were salty and good. Pictured in the background is the hashbrown that Mum had on the side of her wrap. Because see above re potato intake. Other special items on the birthday menu included Brioche Fairy Bread, a Where Do You Get Your Protein Burger (with a walnut, black bean, and zucchini patty), the But Plants Have Feelings Too Burger (with a fried polenta patty), a three scoop sundae, and a banana split. It was pretty fun! Grown continues to thrive, and is obviously well on the way to their second birthday. I love having this place in Brisbane, it is something special and I love it! 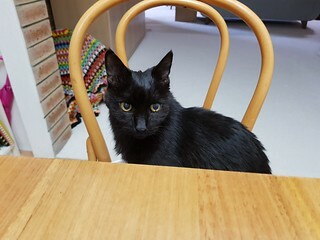 One little cat sitting at the table. Dim Sim rarely is interested in the table of what goes on top of it. Sahara used to love sitting on a chair or on a lap. I popped Dim Sim on this chair when I was putting her down from a hug walk, and she stayed and watched me for a little bit. Even though it's kind of strange for a cheeseburger, the first burger with the confit sounds really good, especially with a hash brown. And the fries!!!! Dim Sim is looking gorgeous as always! It was good, just not really cheeseburger-esque. But a fun take on a burger. Oooh that all looks so good! The tofu scramble wrap sounds so delicious and those fries! Yum! Too bad you couldn't taste the cheese, that burger does look delicious thought. Dim Sim is so pretty! If only there had been stronger cheese! 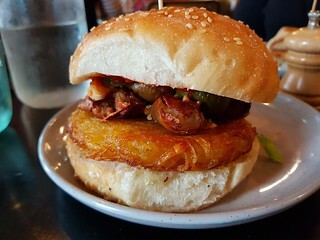 Great idea to add a hashbrown to the burger, too bad there wasn't a patty! The scrambled tofu wrap sounds delicious, and those fries, too!